I'm going to say this first: I did not think that I was going to be able to finish this book. This book turned movie (starring the fabulous Zoey Deutch, which I've yet to see) is told through the point of a 17-year-old mean girl in high school who has even meaner friends. I didn't think I was going to be able to tolerate their behavior in the slightest. I took to reading online reviews after the first fifty pages or so to see if anyone else was having the same issue as me. There were plenty of positive reviews about this book and quite a few reassured me that it would get better and maybe I wouldn't be so pissed off by Sam Kingston (narrator) and her group of friends (Ally, Elody, Lindsay). Sam dies. You find this out early in the book. 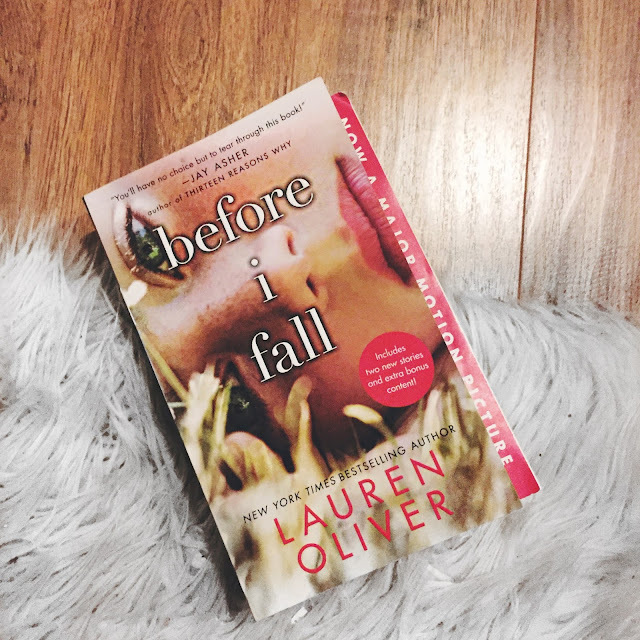 She dies in a car accident and the entire book is her reliving that day over and over again, stuck in this time warp that always ends the same way (kind of). Sam relives February 12th so many times, switching up her attitude and actions in order to try to change the outcome. With each day, we see her grow (and sometimes regress) in an attempt to get things right once and for all. The book can get a little repetitive. I mean, how could it not? It's literally the same day over and over and over again. But yet, despite this never-ending cycle of waking up to her alarm, going through the school day, going to the party, and ultimately dying in some sort of accident, you want to keep reading. You want to see Sam get it right, see if she can truly change the outcome. In each of these days, we see Sam grow and change, realizing all of the wrong that she and her friends have been doing this entire time. Any other plot points I share would spoil the book. Let me just say, the last few Fridays that Sam relives are worth making it to the end of the book. You have to power through a lot of mean girl mentality (and honestly, just mean teenager mentality in general) to get there. You'll cringe, set the book down, and might wonder if it's worth it. To me, it is. It's been a hot second since I've been in high school, but this kind of high school hierarchy mentality doesn't completely die the second you walk across that stage and move on to college. I don't think that this mentality ever really dies. It's always around, whether we like it or not. I think we're all guilty of it too. Even the most level-headed, courteous and kind people can think superior thoughts and let snide comments slip-out. Even if you're not catty by nature, sometimes you just get so salty and frustrated that the words leave your mouth before you even realize it. This is just another healthy reminder to be kind, no matter what age you are, where you go to school, what your friends and peers are saying. Sounds like an interesting read! I'm in need of a new book, so I might check it out.